These If You Give a Mouse a Cookie Printables and Crafts pair perfectly with the books in the If You Give a Mouse… series by Laura Numeroff! I’ve not met a kid yet who doesn’t love Laura Numeroff’s “If You Give…” series. 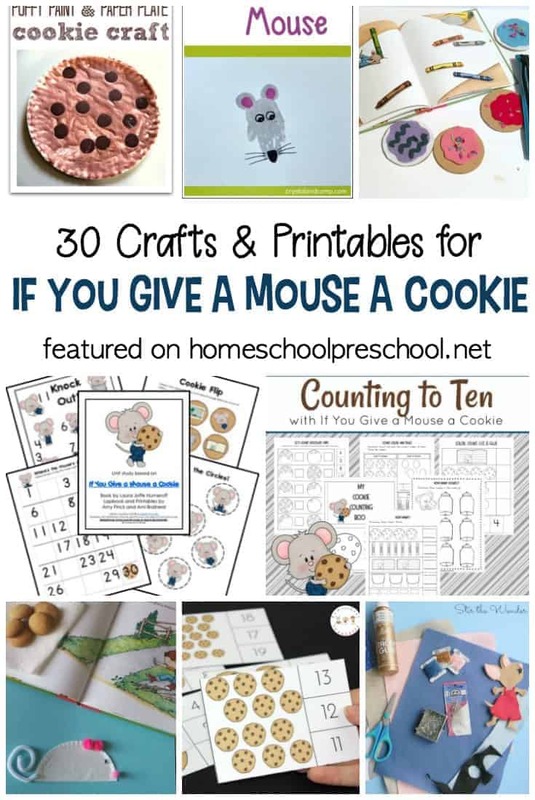 The printables and crafts featured below go perfectly with If You Give a Mouse a Cookie. But, they can also be used with any of the mouse-themed books in the series. Most of these crafts and printables are simple, no- or low-prep activities that you can do with your toddlers and preschoolers. A few take a little more time to set up and prepare, but the time and effort is certainly worth it to bring this fun book to life! This simple M is for Mouse Cupcake Liner Craft is easy to make and can be done in minutes with just a few common craft items. I’ve always been a fan of handprint crafts, because they make such cute keepsakes. This M is for Mouse Handprint Craft is no exception. If you find this post near Christmas, you might enjoy having your little ones create Mouse-Themed Thumbprint Ornament to hang on the tree. If you don’t have felt to create this DIY Mouse Headband you can use construction paper. Kids will love wearing this as they pretend to be a mouse and act out the story. Sensory bins don’t get much better than a sensory bin full of chocolate chip cookie cereal! Your preschoolers will love exploring this If You Give a Mouse a Cookie Sensory Bin while you read the story just one more time. This simple Mouse Pencil Topper is a fun way to extend the story. Kids will love making them, slipping them on their own pencils, and then working through some of the printables featured below. Beginning readers will love making a Mouse Pointer out of a plastic spoon. It’s the perfect way to help them track left to right as they read If You Give a Mouse a Cookie to you. This Puffy Paint Chocolate Chip Cookie Craft is really two crafts in one. Little ones can help you mix up a batch of homemade puffy paint before using it to create a paper plate cookie. I love the idea of using contact paper to complete this no-mess Sticky Cookie Craft with toddlers and preschoolers. Toddlers and preschoolers will love decorating these cookies included in this Felt Cookie Busy Bag over and over again. Use this simple picture tutorial to learn how to make your very own Felt Mouse. He’ll make the perfect addition to your story-themed sensory bins and playtime activities. Gather up all of the old plastic lids you can find, and turn them into number cookies. Then, your preschoolers can play this If You Give a Mouse a Cookie Number Game over and over again. Little ones will work on fine motor skills as they cut, paste, and decorate with this Fine Motor Cookie Craft. Young crafters can make a Paper Bag Mouse Puppet to use for storytelling and pretend play. This DIY Cookie Math Game helps toddlers and preschoolers with counting and 1-to-1 correspondence. 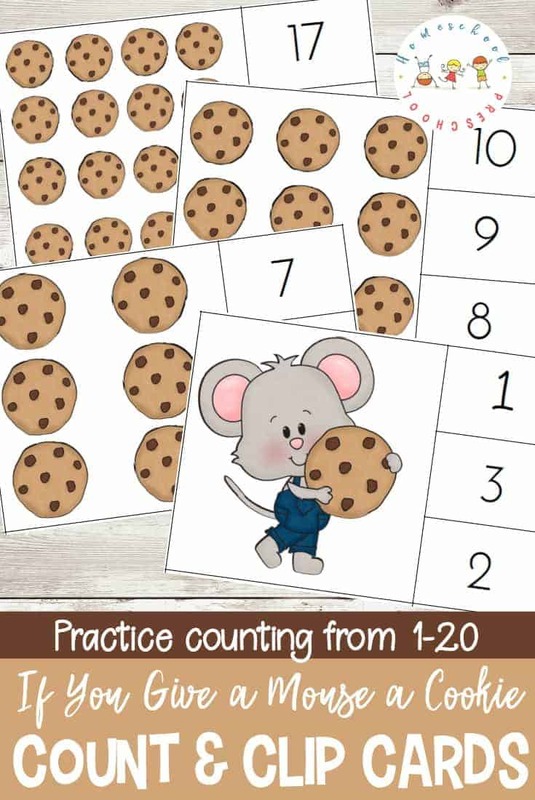 Preschoolers can practice counting to ten with this set of If You Give a Mouse a Cookie Counting Activities. Clip cards help little ones focus on a particular skill while working on their fine motor skills. This set of Cookie Count and Clip Cards will help your preschoolers practice counting to twenty. 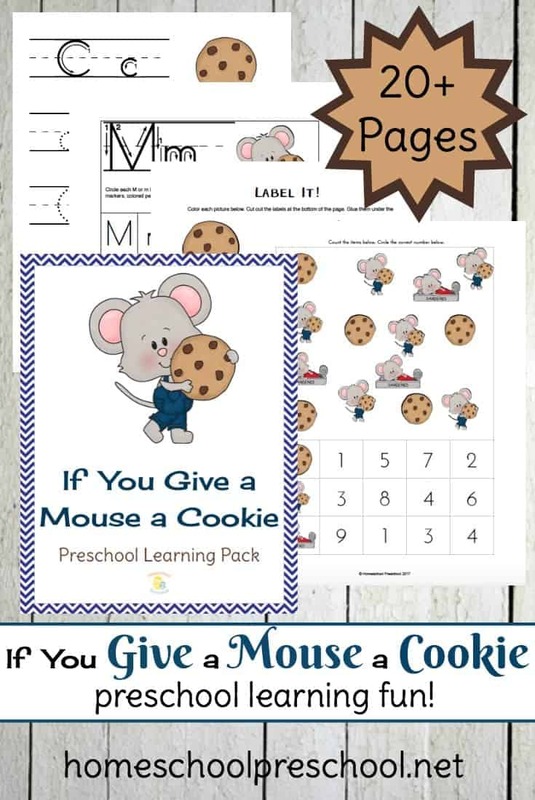 There are more than 20 early math and literacy activity pages in this If You Give a Mouse a Cookie Preschool Learning Pack. Grab a box of Cookie Crisp cereal, and let your preschoolers use them to build numbers on these If You Give a Mouse a Cookie Counting Mats. Print out these alphabet cookies, and then head outside with your preschoolers to play a Sidewalk Chalk Alphabet Cookie Game. 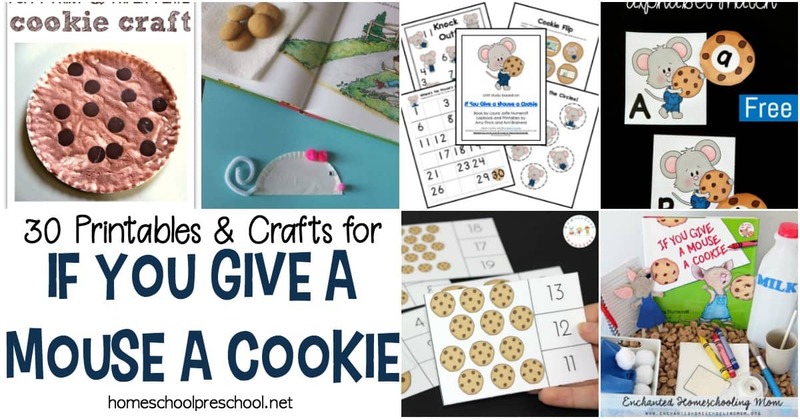 If you use lapbooks with your preschoolers, be sure to check out this set of If You Give a Mouse a Cookie Lapbook Printables. 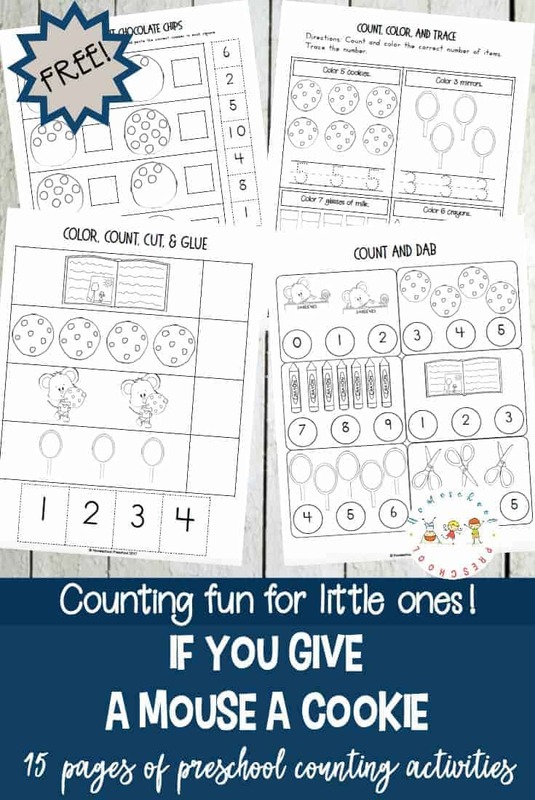 Kids will enjoy practicing numbers, letters, and more with this 45-page pack of If You Give a Mouse a Cookie Worksheets. Preschoolers can work on letter recognition and matching uppercase and lowercase letters with this Mouse and Cookie Alphabet Match activity. These printable cookies are perfect for If You Give a Mouse a Cookie Counting practice as little ones use dot markers to make chocolate chip cookies. These Cookie Counting Playdough Mats will encourage young learners to count “chocolate chips” as they make their own playdough cookies. I love how this Visual Recipe for Chocolate Chip Cookies encourages young children to get in the kitchen and help make a tasty snack. Here you can find If You Give a Mouse a Cookie Packs for both toddlers and preschoolers. Kids can practice shape recognition with this 2D Shape Cookies and Milk Freebie. This no-prep Cookie Ten Frame Matching Game will have your kids working on counting to ten as well as number recognition. Rhyming is so much fun with these Rhyming Cookies. Kids will match a cookie to its proper cookie jar by matching the rhyming words on each one. With so many fun If You Give a Mouse a Cookie Printables and Crafts to choose from, how will you choose where to start? Tara is a Southern girl at heart and mother of 3. As a longtime homeschool momma, she is passionate about equipping and encouraging mommas in their efforts to educate their littlest learners at home. Tara loves to crochet and read in her downtime. She is also a self-proclaimed planner addict and shutterbug! If you've got older kids, you'll want to check out Tara's other blog, Embark on the Journey.. Affiliate links are used on this site, which help to provide support for our family and homeschool.